Yes, there is a difference between trigger points (TRPs) and fibromyalgia tender points. This is essential to know. Especially when it comes to aggravating factors commonly found with trigger points. It is important to distinguish between the two in order to obtain better understanding and working solutions. A trigger point is actually more than one "point" as it is part of a taut band, much like rubber that is not exactly pliable to touch. TRP's can be active or latent. 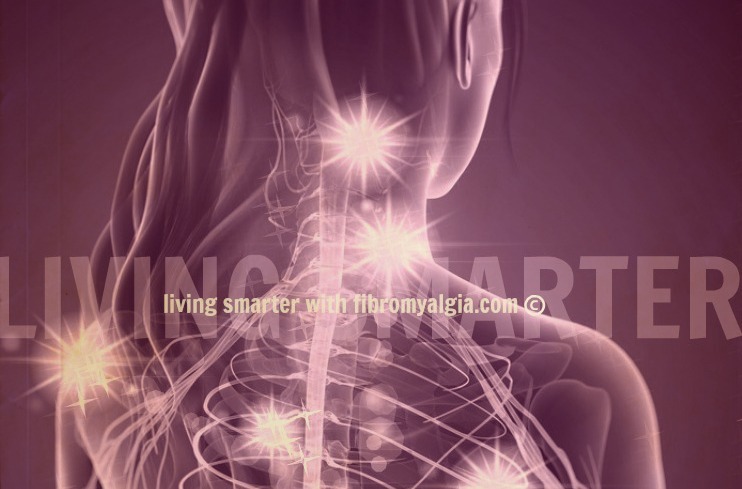 Many people with or without fibro have latent trigger points, actually we all have them. They can come out of "hiding" due to illness, accident or injury. Unlike tender areas of the fibro body, these trigger points can contribute to inflammation. Trigger points are primarily due to myofascial constriction. This constriction causes the pain to radiate to other areas (muscles, tendons, joints) within close proximity. TRP's do not act alone like the 12-18 tender points. They are "woven" into layers of muscle and fascia and radiate from the central part of each tender point and from the more vulnerable parts of the fibro body. Although the tender points have an 18-point evaluation test, this is not so easy with fibromyalgia trigger points. Why? Because trigger points occur over MANY areas of the body and often times in layers. These layers can take place within muscle groups, muscle fibers, tendons and/or near organs that may be compromised in some way. The other interesting thing is that if you see the standard 18-locations tender points test, it looks pretty cut and dry.However, if you have a fibromyalgia patient map out their radiating trigger points, it can often look like a war zone!! That is why you might often feel that you were beat up, run over and left with little energy; this kind of radiating and knotting pain takes up a lot of energy within the fibro body. There are some very common fibromyalgia trigger points within the fibro body around the sternum. That is why people with fibromyalgia often complain of chest pain. Trigger Points can also be one contributor of pain around the rib area, also known as Costochondritis. This particular symptom is one that tends to wax and wane. However, it can be painful with stabbing and burning sensations around the ribs and lower chest area. When symptoms are waxing, try to find a comfortable position and be sure that under garments are not constricting the upper body. Because we use our hands and arms often for many daily activities of living, we have to be careful about repetitive motion that we have control over. Carpal Tunnel Syndrome can occur with excess use of computers, cell phones, heavy lifting without proper upper body strength OR even when wearing bracelets and watches. Any of these can perpetuate nerve entrapment or activate trigger points. Other common fibromyalgia trigger points occur around the back of the head, neck and skull area. 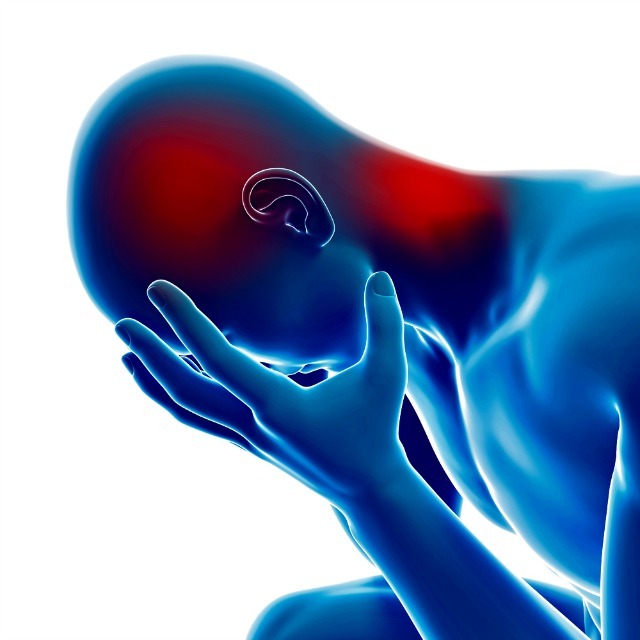 These TRPs can radiate pain from the back to the front of the head, even causing sinus pain, TMJ and migraine headaches. One of the major perpetuating factors to TRP's in the head area is our environment. We need to be diligent about toxins within our home, the people around us or any place that we regularly reside. Too often, people are surrounded by aggravating factors and may not know it. The pain from an environmental exposure feels just the same as pain from a physical injury .. so even though it might feel like the pain is stemming from a structural strain or injury, the pain could stem from a toxic exposure which then 'attacks' the physical body.. NOTE: Refer to Fibromyalgia-Flare page/article to better understand ALL of the perpetuating factors. These factors contribute directly to trigger points, referring pain, and all of our fibromyalgia symptoms. Two common areas for trigger points that can be interrelated are the pelvic area and down the legs. Abdominal or pelvic congestion can perpetuate pelvic pain and TRPs here. Abdominal surgery can also increase the propensity for trigger points in the pelvic or bladder area. Bladder symptoms may include spasms or a need to urinate frequently. On the other hand, you might feel a fullness in the bladder/pelvic area and not be able to urinate freely and you may feel a retention within the bladder and lower abdomen. This picture illustrates the TRPs here in the Sartorius muscle and how they can affect radiating pain above (pelvic area) and below (knees and legs). 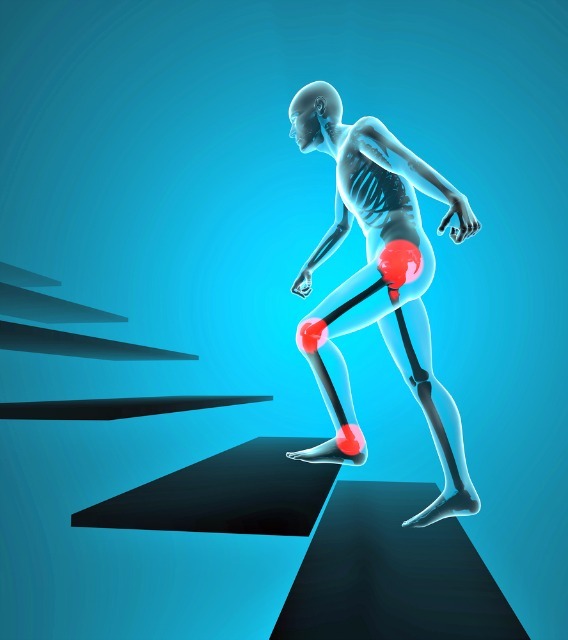 It is important to note that hamstrings (back of legs) are greatly affected by TRPs in the legs and knees and that working these may be difficult for many people on their own. Follow on the Fibro Fit People facebook page. I have videos where I show various tools for working fascia and trigger points. No worries, there is always more than one way. Tight hamstrings can greatly exacerbate knee pain …and with fibromyalgia trigger points, we cannot afford that. Another trigger point that can aggravate the fibro body first thing in the morning is around the fascia on the bottoms of the feet . This area contracts when we are off our feet and resting for many hours. This can cause the “burning” pain that many people often refer to. Again, this is one area that responds well to “rolling”. Using a tennis ball or designated foot roller which can be obtained through sports therapy centers or online is very helpful and can also help to relax other parts of the body through the pressure points on the bottoms of the feet. One way in which I have come to specialize in working with fibromyalgia, is teaching HOW to work around these TRP's while staying strong and agile. Safe and fibro-specific exercise is so essential when living with fibromyalgia and related conditions AND while aging at the same time. Follow on the Fibro Fit People facebook page for more support. I have videos there showing various tools and ways to work fascia, trigger points and myofascial pain. Some additional bodywork I have used and recommend as part of a treatment plan include Rolfing and Bowen. Rolfing is a type of massage technique for working (relaxing) the myofascial tissue. I have found both to be highly beneficial. Bowen therapy helps to relax and re-align the body, especially the more vulnerable areas of the body affected by fibromyalgia. Bowen is different from traditional massage and it is often advised to avoid other types of bodywork when engaging in Bowen therapy. Check in your area for a qualified Bowen therapist. Keep in mind that no one can legally claim to be a "rolfer" unless they graduated from the single school that teaches it. The treatment generally consists of a fixed series of sessions; however, the person I worked with was very helpful in arranging the schedule to make it affordable as well as successful. We must each 'evaluate' our individual needs and continue to employ effective tools when it comes to trigger points, because this can be the most debilitating of symptoms when living with fibromyalgia. Thank you for being here. I hope this continues to be helpful for you.